A refined seaside palette of coral, shell, sand and even moss creates a soothing luxurious oasis in this guest room by Valerie Grant of Valerie Grant Interiors in Summit. To prepare the room, Grant removed the popcorn ceiling and built out the headboard wall to conceal a small side window and create a continuous wall surface. She also removed radiators to allow more room for furniture, added crown molding and had a center ceiling light installed for illumination and as a focal point. With that work done, she was ready to add rich colors, textures and finishes. Behind the modern four-post bed in a metallic pewter finish she added a panel of silk wall covering. On each side she created panels featuring an Asian-motif wall covering in goldleaf frames. The rustic wood tops of the bedside tables were sanded, puttied, smoothed and refinished in a high-gloss tomato red lacquer, and the rustic metal bases were refinished in gold leaf for a sophisticated complement to the bed. The lamps are 1950s-era Balboa Murano glass with parchment shades. Walls are finished in two coats of shell pink metallic Venetian stucco, and the ceiling has a “ghost” vanish border created by mixing mica powder into the stucco for iridescence. Grant then turned her attention to the guest room’s sitting area. “When designing a room, I aim for elegance and proportion, a look that is both classic and luxurious,” she says. “I also want the feeling that you can curl up anywhere.” A loveseat provides just such a spot, covered in velvet and accented with plump pillows that continue the room’s palette. The ottoman in a coral croc pattern adds subtle pattern. The room features a large span of windows. 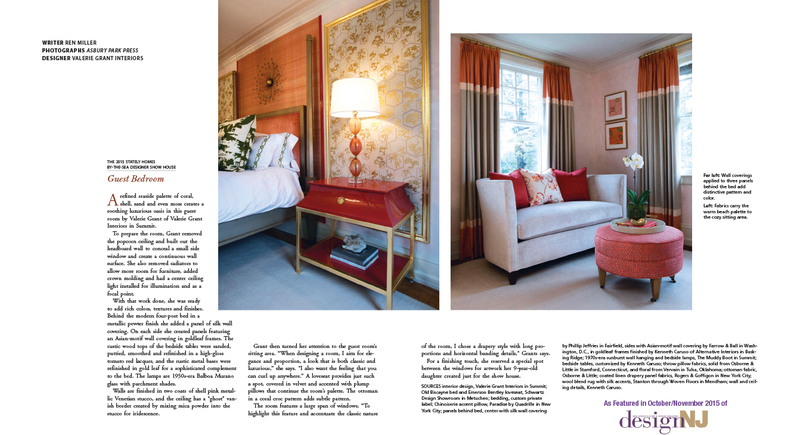 “To highlight this feature and accentuate the classic nature of the room, I chose a drapery style with long proportions and horizontal banding details,” Grants says. For a finishing touch, she reserved a special spot between the windows for artwork her 9-year-old daughter created just for the show house.